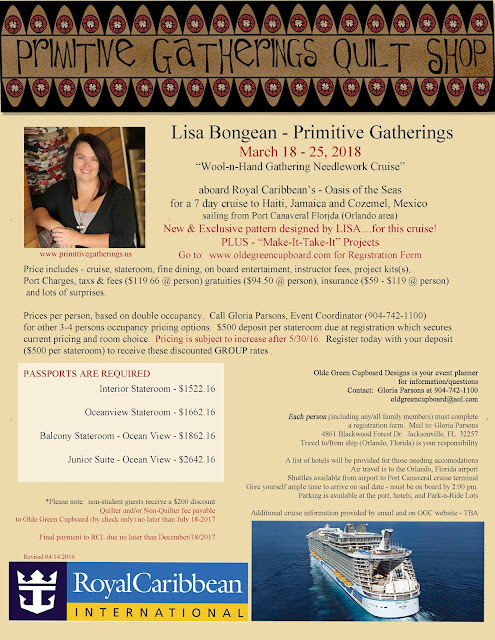 Please join us and Lisa Bongean from Primitive Gatherings on the Royal Caribbean - Oasis of the Seas on a fabulous 7 night cruise to the Western Caribbean! We'll visit the private island of Royal Caribbeans Labadee - Haiti, then on to Falmouth -Jamaica, and Cozumel, Mexico ! 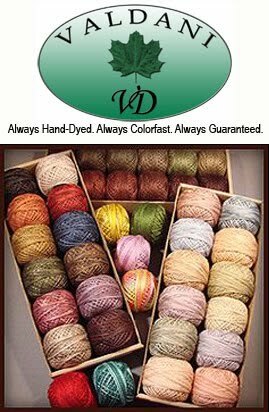 We've reserved the entire conference center on the ship for Lisa's "wool-n-hand" class - exclusively designed for attendees (will be debuted several months before sail date....that gives her the opportunity to use her newest fabric line for you), make-it-take-its, open sewing (don't forget to bring your OWN sewing machine), surprises, shipboard entertainment, great ports for fun-filled excursions & shopping... and MORE! We pre-booked the cruise in advance to be assured we have the entire conference center. Great way to get booked (reserve your reservation) and SAVE your money for final payment(almost 2 years), shopping and fun port adventure excursions. Final payment is not due until 90 days prior to sail date! Lisa's cruise filled up in less than 3 weeks this past February.... so don't delay.... sign up today! Email: oldgreencupboard@aol.com if you have questions!